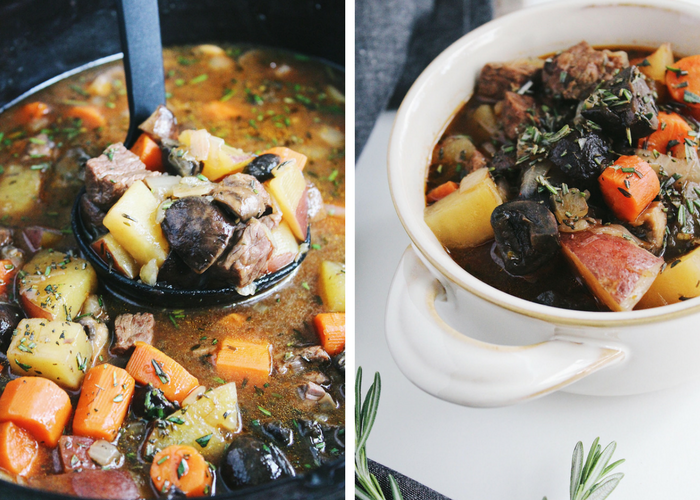 This Slow-Cooker Paleo Beef Stew is Whole 30 approved, dairy-free, gluten-free, and delicious! A rich, high-quality bone broth is key. This winter was just brutal. I couldn’t be more excited and impatient for spring to arrive. 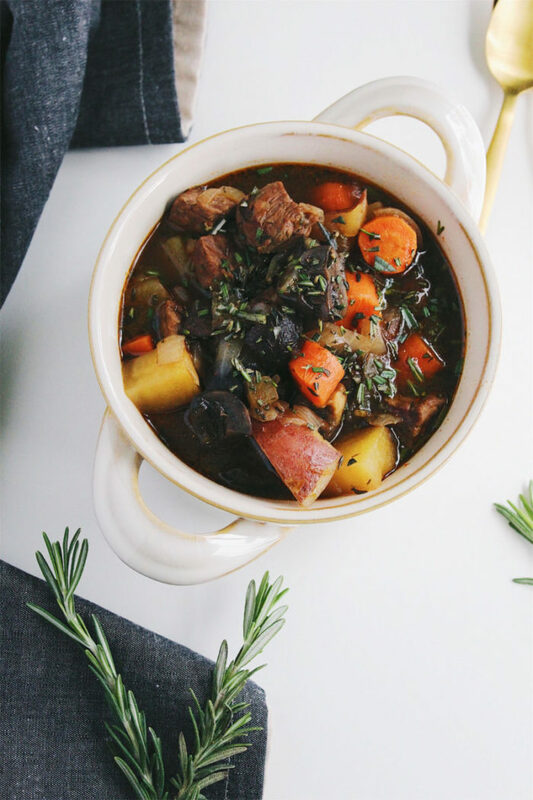 The best part about winter, however, was the cozy, warm comfort foods, like this slow-cooker Paleo beef stew. I’m not so sure I would have made it through February without it. 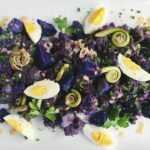 I don’t eat Paleo myself, but I’m always all for creating new, healthy recipes. I have tons of friends who eat different diets—from Paleo to gluten-free to vegan. I’m always up for making them something delicious when we’re together. I have, however, done the Whole 30. So I became very acquainted with Paleo recipes. Even friendly, I would say. Stew always reminds me of my grandmother’s house growing up. My grandfather would always have a big pot of stew simmering away all day. The slow cooker does the work for you here, ensuring the end result is an immensely flavorful stew full of tender beef. 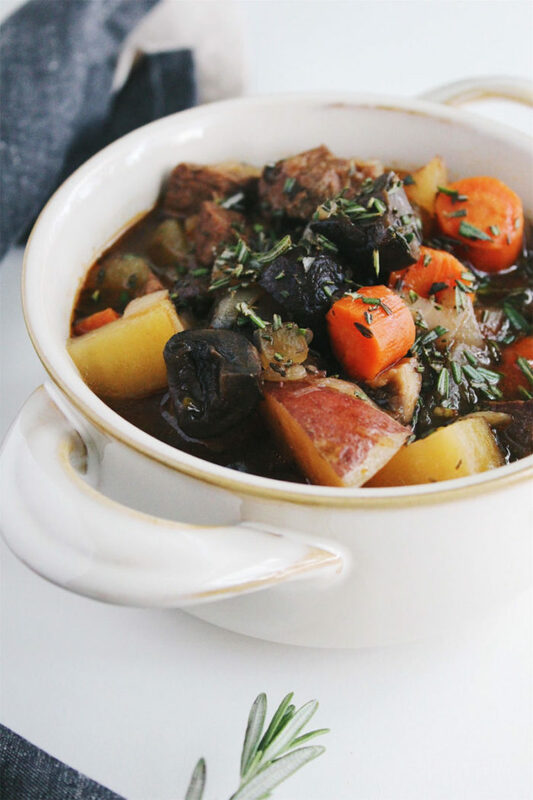 This slow-cooker Paleo beef stew has tons of goodies in it. 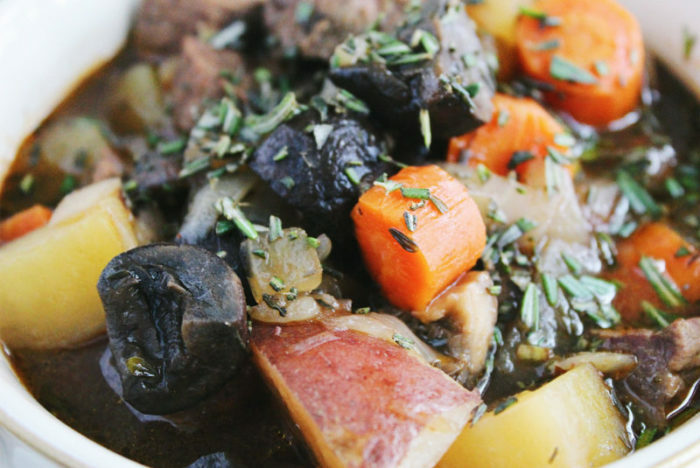 Tender beef, carrots, onions, fragrant fresh herbs, potatoes, and earthy mushrooms. While it does use white potatoes, you could absolutely replace them with sweet potatoes or parsnips. White potatoes are fairly argued when it comes to the Paleo diet, so I’ll let you decide that one. The star of the recipe here is a really great bone broth. But if you don’t have it, a high-quality beef broth is fine. What is bone broth, anyway? Bone broth is a bit different from your basic stock or broth that you’d find in the store. What makes it different is mainly one thing: the bones (chicken, beef, or fish) are slow simmered for much longer (usually a minimum of 12 hours). This creates a thicker stock from the bone’s natural gelatin. Due to a longer cooking time, it also extracts more nutrients, minerals, amino acids, and collagen from the bones. What results is a protein-rich stock that has an ample amount of vitamins, calcium, magnesium, and iron. The benefits of bone broth range from boosting immunity to fighting inflammation to supporting bone and skin health. You can read more about the benefits of bone broth here. My personal favorite brand is Kettle Fire’s organic bone broth, which can be purchased on Amazon. You can also try making your own bone broth, but be sure to avoid these mistakes. 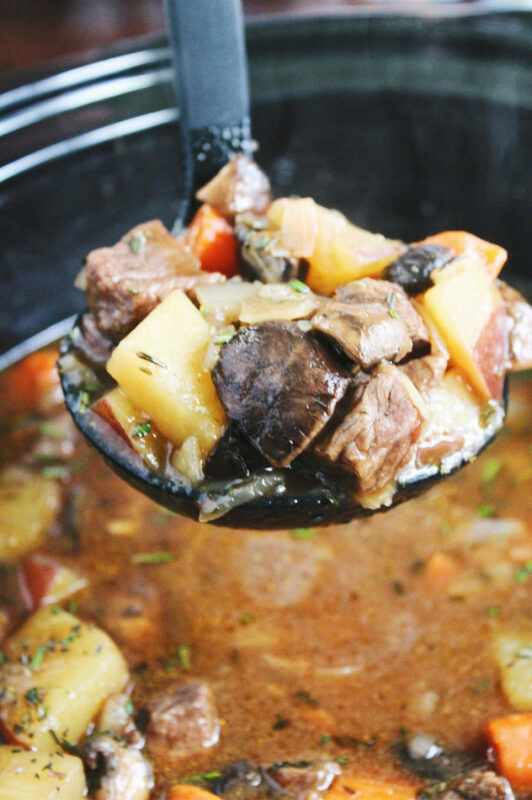 I hope you enjoy this Slow-Cooker Paleo Beef Stew! What’s your favorite kind of paleo comfort foods? Tell me in the comments below! 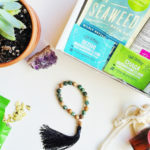 This post contains affiliate links, but are always products I highly recommend. Heat a saute pan with the olive oil and brown the beef chuck until evenly browned on all sides. Add the browned beef to the slow-cooker with the bone broth, carrots, onion, potatoes, garlic, mushrooms, Coconut Aminos, tomato paste, and all of the seasonings except the fresh rosemary. Stir everything together. Cook the stew on low for 8 hours, adding in the rosemary during the last 20 minutes. Serve with additional fresh rosemary on top. Enjoy! *If you don’t eat potatoes on your Paleo diet, use parsnips or sweet potatoes here instead. Tiffany, WOW! so simple, yet SO tasty! This is fantastic, yum. Thanks for the recipe. Tiffany. thank you for sharing this! I have made this so many times. Everyone that tries it, loves it! Tiffany, that recipe looks so yummy! I’ll have to try that one. Thanks for sharing. I think Turnips or Radishes would be a good substitute for the potatoes. 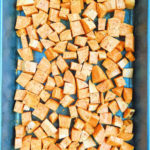 They are lower carb than potatoes, sweet potatoes or parsnips. Made it today! So incredibly easy and it was perfect. Family loved it, even my picky 4-year-old. Bone broth made it much more flavorful than your average stew. This looks so good! I’m a bit confused what red potatoes are though? I’m in australia so wonder if we call by another name? Any ideas? Thanks! hi! how do you think it might go without tomato paste? i forgot to buy tomato paste, and the nearest grocery is a keyfood which won’t have a good ingredients version. hmm… ok, just different probably? thanks! Hi, Cat! You can definitely make it without the tomato paste. The tomato paste helps thicken the stew a bit and adds subtle tomato flavor to increase the savoriness. I am unable to afford bone broth. It is OK to use organic unsalted beef stock? Anyway, That is what I did and the stew was delicious. Totally fine Judy! The stew just probably won’t be as thick as when using bone broth. Glad you enjoyed it! It’s in the crock pot now … if I’m using dried rosemary, should I add sooner than 20 minutes to end? I’ve also turned slow cooker to high so that it finishes before midnight. Thanks for the feedback and what looks to be a fabulous recipe. I’m very excited to try it! Hey Karen! You can add the dried rosemary in at any point 🙂 let me know how you like it! Beef stew is one of my favorites! Great to have in the Winter. Thanks for the new recipe. This looks like a delicious and hearty stew. I don’t eat paleo but this would be good for those who do. This recipe is killer. It is definitely on my menu now. My husband was just saying he wanted some beef stew! 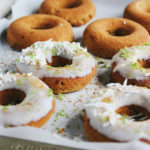 This recipe looks delicious and I have just about all the ingredients to make it! Yum! I agree. Winter has been devestating so far. It’s winters like this that keep my slow cooker going all season long. Nothing beats soup and stew when it’s freezing out. 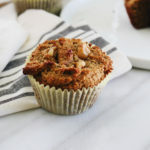 I love finding new Paleo recipes and I’m loving the looks of this one! 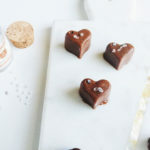 I try to incorporate bone broth into my diet as much as I can so I am especially glad that this recipe uses it. It looks absolutely delicious! Oh now this sounds like a delicious recipe, I can imagine my other half really loving this as an evening meal after a long day. It’s very sweet, taste like it has molasses in…. coconut aminos is a mistake. I threw the whole thing out. Sorry you didn’t care for the stew Sheila. Coconut aminos is very common in paleo stews because it’s hard to find compliant Worcestershire, but you could definitely use that instead. 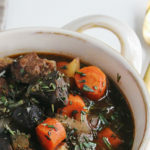 This Paleo Beef Stew Slow Cooker Recipe is simple to make and can be tossed in the slow cooker cook all day while you do your tasks. This stew was incredibly flavorful and hearty. It was perfect for a brisk, fall weekday. It was easy to prepare. I can’t wait to make it again! I love all things stew! 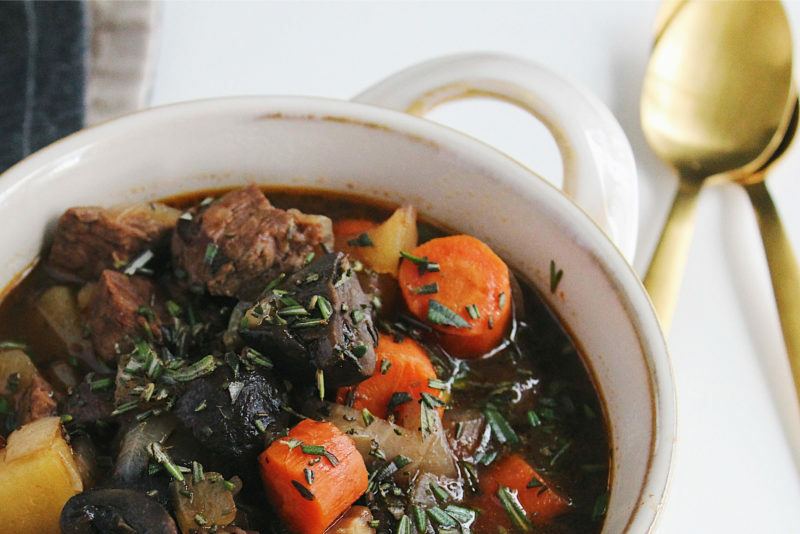 I just instantly feel like a million bucks after a hearty bowl of stew and I can’t wait to make this! This looks like a fabulous stew! My husband only likes soups and stews that are chock full of meat and veggies. Your stew certainly seems like it would fit the bill! If that’s his criteria, I am sure he will love it! Thanks Ana. This stew is so good! There is nothing like a nice pot of stew on a cold winter’s day. This stew has a lot of flavor and just the photos alone will make you drool!